Handbrake Review: Is It the Best Free Mac Video Converter? With the technological development, there are more and more forms of entertainment, among which video watching comes first on the list. But chances that the video file you can play on your iPad don't mean it is readable on your new HTC One. In this case, a great number of video transcoders spring up and let people convert video from one to another. Compared with the priced software, Handbrake, the open-source free Mac video converter, is more popular with people, especially those who are on tight budget. Is Handbrake Perfect? Does It Have Any Drawbacks? The advantage of Handbrake lies in that most of the settings are already preset for you. What you need to do is just loading the video file, choosing the format or the device you want to convert to) and then starting the conversion process. In spite of this, just as every bean has its black, Handbrake only converts common video files to MKV and MP4 formats, making you down in the mouth if you want to get AVI or FLV output format to upload to YouTube. Worse still, Handbrake's bad compatibility with Mac OS X El Capitan may easily drive you crazy. Therefore, Handbrake is far from the best video transcoder for Mac, despite enjoying great popularity. Which is the Best Free Video Converter for Mac? Are you seeking for another free Mac video processing tool to cover Handbrake's storage? Well, you come to the right place. 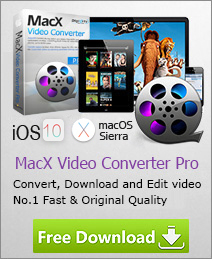 MacX Video Converter Free is recommended to you, helping you convert video for free with stunning video quality. It works well to convert video files among all HD videos and SD videos like converting MKV to AVI, WMV to MOV, FLV to MPO, MP4 to MP3, etc, and also furnishes ready-to-use profiles for iPhone, iPad, iPod, Android, Blackberry and other devices. 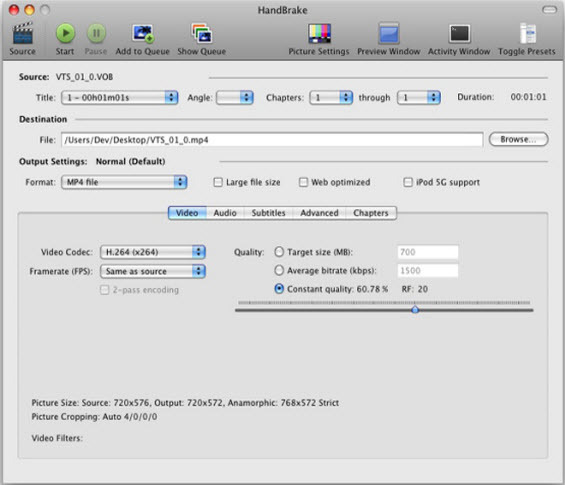 Thanks to the Hyper-threading technology and wizard-style interface, this free-to-use Handbrake for Mac alternative can finish the video conversion process as breeze. With this free Mac video converter, you are also enabled to capture snapshot and extract music from videos. Best-ever video conversion Mac freeware to convert videos to MP4, MOV, M4V, MP3, etc for playback on iPhone X/8/7, iPad mini 4/Air 2/Pro, Android Samsung Sony HTC 83X faster speed & no quality loss. After free downloading this free video encoder on macOS, and run it. Click "Add File" to load the file you want to convert. You also can import several files for conversion at one time because of the batch files processing model. Choose the output format from the output format bar according to personal demand. 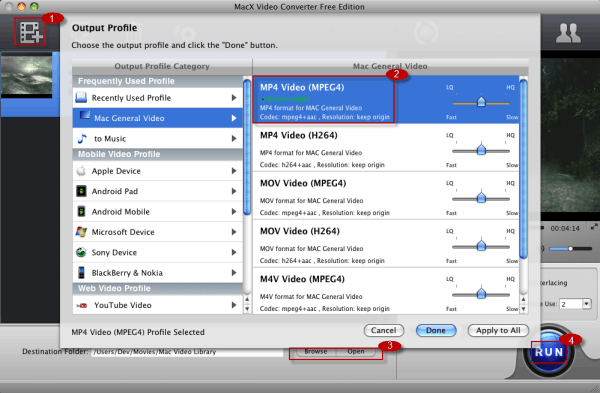 Here we take free convert video to MP4 on Mac as an example. With the adjustable parameter setting, you can customize the encoding settings like resolution, frame rate, bit rate, sample rate, etc, as you like. Click the "Browse" button to select a folder where you want to place your converted video. Finally, click the "RUN" button to start to convert video for free on Mac with this mac free video converter. You can view the conversion progress or cancel the converting process at anytime. Apparently, MacX Video Converter Free, surpassing Handbrake, is worth your try as the best free video converter for Mac. For those who would like to convert video to more output formats like iPhone Xs Max, iPad Air, PS4, Xbox, etc, MacX Video Converter Pro is certainly the best assistant. Shipped with website video downloader, this GPU accelerated video processing software can easily download HD videos 1080P 4K 8K UHD from YouTube, Facebook, Dailymotion, Vimeo, Vevo, Instagram, Myspace, Metacafe etc 1000+ video music sharing sites to your beloved gadgets for watching offline.